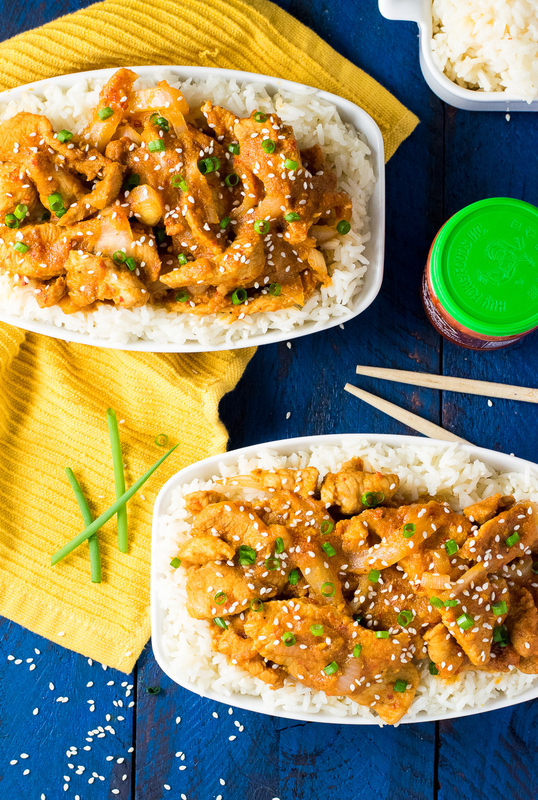 Spicy Pork Bulgogi is a popular Korean dish that features marinated pork in a spicy sauce. This fairly traditional recipe has been updated to be accessible to the American cook. Sometimes it amazes me how much spice is considered normal in other cultures. Don’t get me wrong, I love spicy food so I am totally cool with it. However, growing up in a community comprised mainly of descendants of German and Irish immigrants, the prevailing notion of “spicy” around here is when you over-salt your mashed potatoes. Koreans, however, really know how to spice up a dish! This Spicy Pork Bulgogi is a fairly traditional Korean recipe that is loaded with chili paste, chili flakes, soy sauce, and honey to round it out. Your fork won’t have to travel far to find big flavors here! I have also updated the recipe with recognizable American ingredients to make it easy for the novice American cook to navigate. If you like Asian hot sauces, there is no better hot sauce to serve with this dish than my Homemade Asian Hot Sauce with Thai Peppers. I make a big batch of this once a year and bottle it to ensure I always have some on hand. 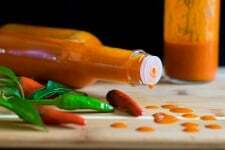 If you have ever wanted to make your own hot sauce, this is the recipe to check out! There are a couple of tricks to ensuring thin cuts of pork. First of all, you will want a well sharpened razor-sharp knife like my Wustof Ikon Chef’s Knife. The sharper edge will make all the difference on these precision cuts. The next best thing you can do is to partially freeze the meat. This will firm it up to make cutting easier. Add all marinade ingredients to a blender and puree until smooth. Slice pork thinly (~1/8") and cut into chunks. Place pork in gallon zip lock bag and add marinade. Let marinate for at least 30 minutes, or overnight. Slice onion into strips and add to heated pan on medium heat with marinated pork. Toss occasionally to ensure even cooking. Pork is done when cooked through. 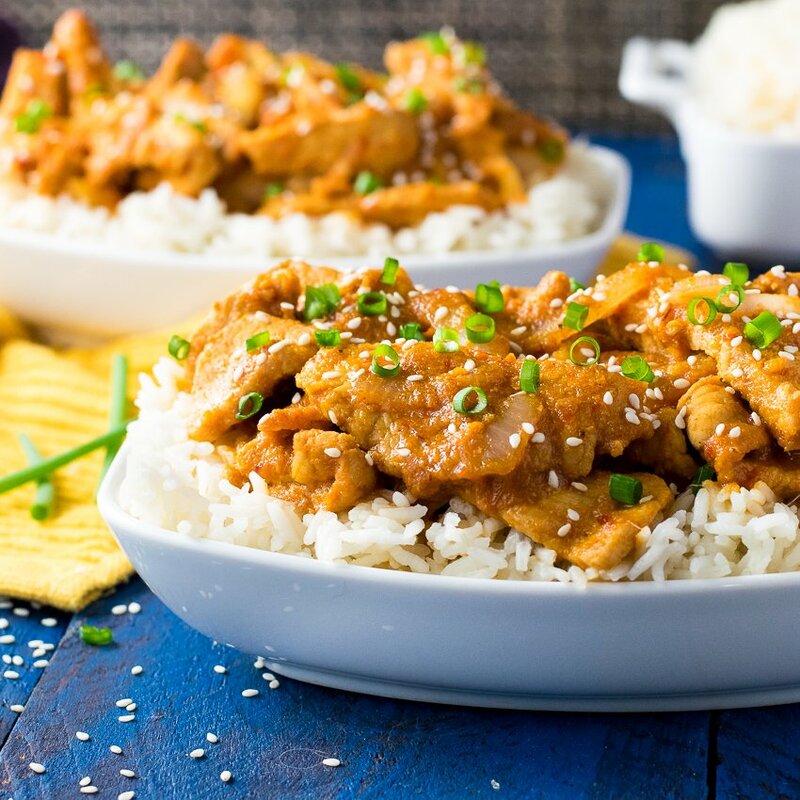 Serve with rice, topped with green onions and sesame seeds. I cooked 1 cup of white rice to serve with this. If you really want to up the authenticity factor, grill the meat rather than cooking it on the stove. 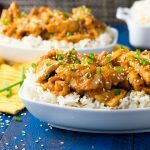 If you enjoyed reading my Korean Spicy Pork Bulgogi recipe then you should probably like me on Facebook and follow me on Pinterest too. That’s what I would do at least, because if you don’t get to know me but you still use my recipe it is kind of like taking candy from a stranger, and your mom taught you not to do that. Don’t disobey your mom, subscribe to Fox Valley Foodie today. This is a very tasty dish great with rice and you can vary the amount of spice or spicy-ness so that’s great too! Thanks for sharing this dish recipe! !